kt literary » Blog Archive » The Big Finish to our 15 Days of Christmas Giveaways! And a rare galley of TUNNEL VISION by Susan Adrian, plus bookmark! Woohoo! What a fun giveaway! Thanks for putting this together. You’ve managed to put most of my favorite authors in one giveaway! Woot! Wow. That’s a lots of good books. 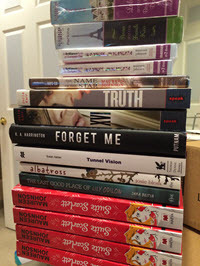 One can never have too many books, but I would loooove the galley for Tunnel vision, I can’t wait to read thw book! I only know two authors on the list, but would love to find out more about the rest. They all look beautifully intriguing. **drools while looking at the picture of books** This is fantastic. I would be super happy with any of these. A big thanks to you for doing these giveaways. You didn’t have to, and I’m sure it’s a bit of trouble for you to organize, so THANK YOU for your generosity. What a great way to get into the festive spirit! I’ve been meaning to read Lola and Anna by Stephanie Perkins for ages! I’ve heard nothing but great things about her books. Thanks for the opportunity! Some really great stuff in here! Thanks! Oh. my. god. you are AMAZING. What a great assortment of books! I’m keeping my fingers crossed. I’m excited for Tunnel Vision!! Oooh such fun! Fingers crossed! Thank you for these wonderful giveaways. Happy holidays to all of you! ANY OF THESE PRIZES WOULD BE AMAZING, YOU GUYS ARE WAYYYYY TO KIND. Oh. YES PLEASE. Is this giveaway international? Either way, that is a great sounding list. This is such an amazing giveaway. Thank you so much for the chance. I would love to read Anna and the French Kiss series!!! This gift pack would give me 15 different reasons to say “Go ask your dad to make you a sandwich/find your socks/plunge the toilet”. I think the giveaway is already over, but my gosh! Stephanie and Maureen are two of my favorite authors! Stephanie writes fantastic books (and specifically characters) and Maureen is probably my favorite person to follow on twitter. Anyway, these giveaways were amazing, thank you for offering up these amazing books and happy holidays. Sweet!! I’d love to win all that! So many winners! Check your inboxes — I’ve sent the winners an email. I’m not going to tell you which prize pack you’ve won, you’ll just get a cool surprise in the mail someday soon!